WASHINGTON — After an alleged Islamic State sympathizer born abroad plowed into pedestrians in Lower Manhattan, killing eight people, President Trump called for an enhanced version of his “extreme vetting” procedures for immigrants. But in the wake of a mass shooting that left 26 dead in Texas on Sunday, Trump’s response was markedly hands-off. He declared that “mental health,” not guns, was the underlying issue. The difference in the response to two cases of mass murder, according to critics, is the massive influence from the country’s largest pro-gun organization: the National Rifle Association. The group endorsed Trump early in his presidential campaign, poured more than $30 million into his election campaign, and has even echoed Trump’s own anti-media messages in its advertising. That support has translated into having a strong friend in the White House. “Donald Trump is the NRA,” said Shannon Watts, the founder of Moms Demand Action, a gun-control group she launched after the 2012 Sandy Hook mass shooting in Connecticut. The clearest evidence: Despite Trump’s being in office when two of the top five deadliest mass shootings in US history were committed — and one additional crime in which members of Congress were targeted — there is almost zero pressure from the Oval Office for initiatives. 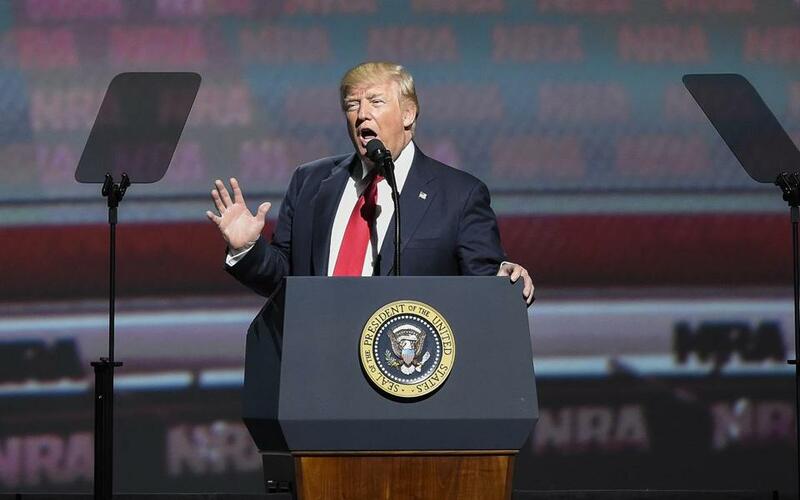 Meanwhile, Trump has addressed NRA events multiple times since he launched his campaign for president, and in April he had warm words for the organization. It’s a promise he’s kept. Beyond saying the issue deserves scrutiny, Trump has not signed on to efforts to ban “bump stocks,’’ the assault rifle accessory that allowed the Oct. 1 Las Vegas shooter to make his rifle work like a machine gun. As Republican leaders sit on the sidelines, Trump’s Justice Department is still reviewing the laws that relate to the devices. Gun-control advocates were hoping Trump might take a more moderate tack once in office. They point to Trump’s earlier and more flexible position on firearms in 2000, as he was pursuing the Reform Party nomination for president, when he said he wanted to curtail sales of high-powered guns. But after spending heavily on Trump, the gun lobby has been struggling simply to defend the status quo, unable to advance its agenda in Congress for expanding gun-friendly laws. The NRA’s top agenda item is to pass a federal law that would allow a gun owner with a permit to carry a concealed weapon in one state to conceal that weapon in any other state that issues such permits, which is virtually every state in the country. Opponents say that would usurp state officials’ authority to regulate those deemed too dangerous to carry a concealed gun in their state. Despite Republican majorities in both chambers of Congress and more than 200 co-sponsors on the main bill for the measure, called “concealed carry reciprocity,’’ there have been no hearings held on the bill, and it seems to be stalled. “The weaker the White House becomes, the more difficult it is to have those hearings,” said Richard Feldman, a former NRA lobbyist and founder of the pro-gun group Independent Firearm Owners. The gun lobby also failed this year to pass a law that would deregulate the sale of silencers, in part due to poor timing. The legislation was headed for the House floor when the Las Vegas massacre occurred, with the gunman firing on a country music concert, killing 58 people in the worst mass shooting in American history. Part of the problem is that the White House has so far been unable to pass any major legislation on any front. But Trump also tends not to talk proactively about pushing a pro-gun agenda and has instead focused on repealing Obamacare and enacting a massive tax cut. In the 2016 election cycle, the NRA and its affiliates spent roughly $60 million on political activities, according to the Center for Responsive Politics. Gun industry titans were among the biggest contributors. Ugo Beretta, president of the gun company that bears his name, and his wife, Monique, are celebrated members of the NRA’s “ring of freedom” circle of donors, as is Smith & Wesson’s CEO, James Debney. But the group’s power goes beyond money. It has a track record of being able to mobilize small-dollar donors. In its 2015 tax filings, the NRA reported $337 million in total revenue, a figure that grew by 65 percent over a decade. The bulk of the NRA’s money comes from membership dues and programming fees — the small amounts that people pay to get an NRA card, receive one of the organization’s magazines, take a gun-safety class, and participate in a powerful social movement. In 2015, that added up to $180 million, according to the group’s IRS filing. That comes to about $40 per person, if the NRA has the 5 million members it claims. Annie Linskey can be reached at annie.linskey@globe.com. Follow her on Twitter @annielinskey. Evan Horowitz can be reached at evan.horowitz@globe.com. Follow him on Twitter @GlobeHorowitz.